This recipe is an excellent source of protein, niacin, vitamin B6, vitamin B12, selenium and zinc; and a good source of iron. Place potatoes in microwave-safe dish. Cover and microwave on HIGH 2-1/2 to 3 minutes or until crisp-tender. Let stand 5 minutes to cool slightly. Thread potato halves onto 10 to 12- inch metal skewers. Thread onion halves onto separate metal skewers. Combine Rub ingredients; reserve 2 tsp. for garnish. Press remaining herb mixture evenly onto beef steaks. 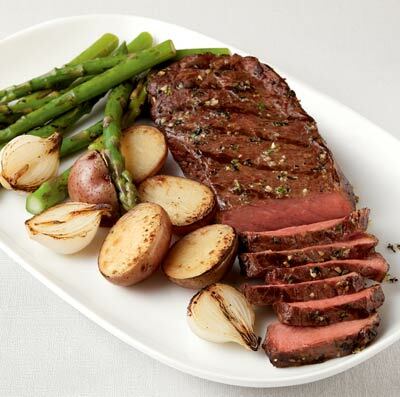 Place steaks in center of grid over medium, ash-covered coals; arrange potatoes, onions and asparagus around steaks. Grill steaks, uncovered, 15 to 18 minutes (over medium heat on preheated gas grill, covered, 11 to 15 minutes) for medium rare (145 degrees) to medium (160 degrees) doneness, turning occasionally. Grill potatoes and onions 5 to 10 minutes (gas grill times remain the same) or until golden brown and tender; grill asparagus 6 to 10 minutes (covered, 8 to 12 minutes on gas grill) or until crisp-tender, turning occasionally. Remove potatoes and onions from skewers; peel onions. Combine potatoes, onions, lemon juice, oil and lemon peel in large bowl. Toss to coat. Season with salt, as desired. Carve steaks into slices. Season with salt, as desired; sprinkle with reserved herb mixture. Serve steaks with grilled vegetables.